Count me in for FREE! Everything you need from pregnancy to tweens! Brand name clothing, cribs, gliders, baby gear, bikes, holiday attire, books, games and more! 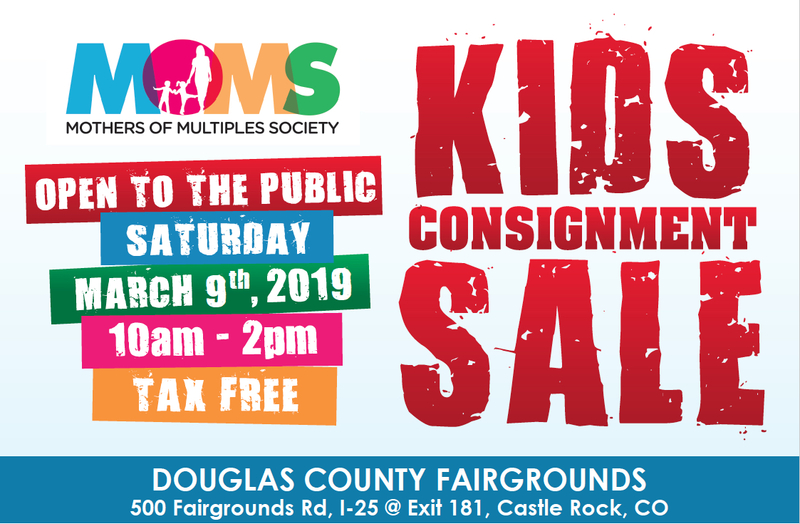 Colorado's largest TAX FREE Kids' Consignment Sale by MOMS is located at the Douglas County Fairgrounds, one mile east of 1-25 at exit 181 in Castle Rock. Shop the 30,000 square-foot space with over 40,000 items of gently-used baby's and children's clothing, baby gear and activities, toys - books - games, bedding, sports equipment - backpacks, furniture (including cribs), nursing equipment, feeding, maternity wear, strollers, Halloween costumes, holiday attire, and more, priced at 50-90% off retail.